The Southern Pacific 4449 came in from the Oregon Rail Heritage Foundation to join the Pere Marquette 1225 at the Train Festival 2009. 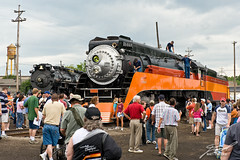 Though the weather wasn't very good (cloudy and rainy), the turn-out seemed pretty good and our photography obscured by the throngs of people hovering around the locomotives. The SP4449 had made a couple runs over the last two days and picked-up from branches in the process. The crew was out cleaning off that debris and the soot as the guests toured the cab. Unfortunately the PM1225 was cold as they ran into a mechanical issue and decided to bench the 400-ton locomotive.